IMPORTANT NOTE: Entries are not considered completed until payment is received (in case of going over-capacity). You will be contacted after you enter with details for payment. There is space for approximately 85 participants. ENTRY RESTRICTIONS: Due to licensing restrictions by Westminster Council placed on the building in which the congress is being held, the tournament is only open to people over the age of 18 (as of 21/Apr/2017). 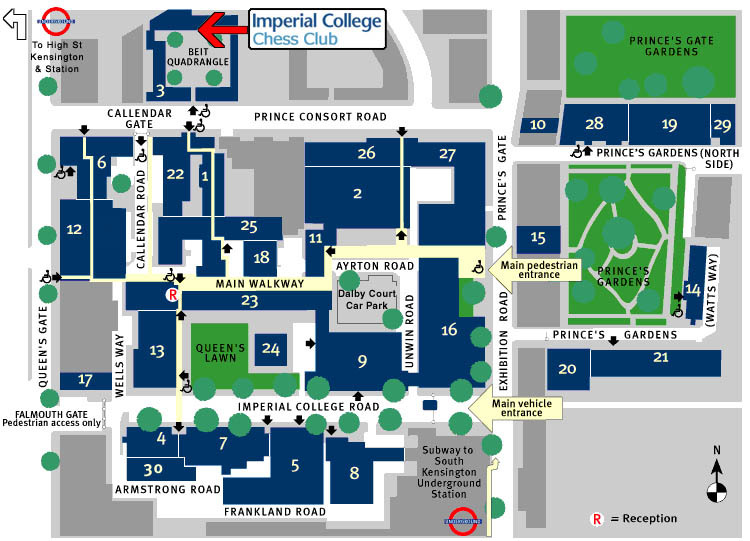 Imperial College has a history of hosting chess congresses several decades ago, and revived the tradition with its first long-play congress in over a decade in late 2011. We have since followed up with multiple events and this will be number seven! The event will be held in the Union Dining Hall on the first floor of the main Imperial College Union building (note: this is different from the last congress which was on the 2/F in the Union Concert Hall). When you walk into the Beit Quadrangle, walk straight ahead through the clearing and enter the main Union building. Upstairs on the first floor is the venue. There are two lifts you can use. ← Thank You for Entering the Central London Chess Congress!